A severance can go a long way in helping the employee transition from employment. Always conditioned on execution of a release and waiver of claims arising from the employment relationship, it is a relatively inexpensive way to avoid litigation, especially if the discharged employee is a member of any protected class under state or federal anti-discrimination laws. Obviously, when the employee has engaged in egregious misconduct, a severance is rarely offered. Except in the cases where an employee has engaged in egregious, willful misconduct, or their negligence has significantly harmed the organization or an individual, no reason generally exists to be anything but professional and respectful of the person being discharged. Performance deficiencies or poor work outcomes do not make that employee less deserving of respect than any other. Remember that none of us would likely succeed at every job. Especially when the employee has not engaged in bad behavior, deliver the news directly and honestly and listen to what the employee has to say in response (unless it is threatening, vulgar or inappropriate in some other way). This doesn’t have to continue for long, and it will likely not change your decision, but it is a more positive way to end the working relationship. Think about romantic breakups; a discharge is not much different. The person receiving the bad news wants to know why and wants a chance to speak their piece. Give that to them. Even the most entry level employee has co-workers with whom they are friendly and will feel unsettled about their co-worker leaving. They may also be worried about their own job security. Close friends and/or family members of an employee being discharged should be met with individually to reinforce the message that you regret that the discharge was necessary and you are interested in maintaining a good working relationship with the employee who remains. Members of a department or those in the same job title should be reassured that the decision was not made lightly and your hope is to move forward and maintain good morale and productivity among the staff. 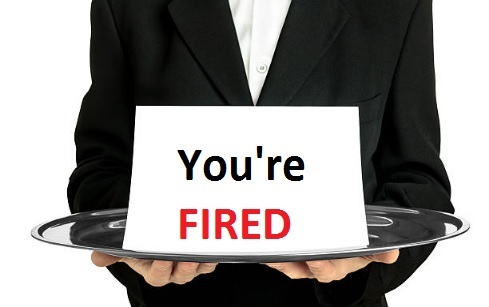 The ripple effect of a termination increases when the discharged employee is higher up in the organization. Sometimes that ripple effect is a good one when change was obviously necessary, but people rarely like change overall and unless the employee being discharged was an absolute tyrant, they likely have some staff members who feel exposed to discharge themselves or just unhappy to see the person leave. Talking bad about a former employee makes you look either petty or arrogant. Even the discharge of the worst employee in the organization’s history should be dealt with by the employer with a positive forward-facing message to others. Always remember that although an employee didn’t work out with your organization, they may be hugely successful somewhere else. Rarely are employees rotten to the core. More likely, they just didn’t work out in your organization. You may run into them again when they are in a position to influence a decision about you or your organization. Don’t you want them to remember that you were decent to them? Like any bad news, the recipient struggles to absorb what is said to them, likely hearing only bits and pieces of the discussion. A follow up letter which reiterates the statements made by the employer in the discharge meeting accomplishes two things. One, it accurately documents what was told to the employee about the reasons for discharge, serving as a record of these reasons should litigation follow, and informs any advisor with whom the discharged employee might seek counsel, of the employer’s position in the matter, as opposed to the impressions of the terminated employee, which might be so clouded by emotion that they inaccurately recount the events or discussion. Secondly, a follow up letter reminds the employee of other important information, such as when they will receive their last paycheck and when their health insurance coverage will expire.